AVAIL MOVE IN DATE 07/1/19**UNFURNISHED-Gorgeous home, gated community on corner lot with many custom features. 3 generous sized bedrooms, den/office, living area, formal dining, and family room with fireplace. 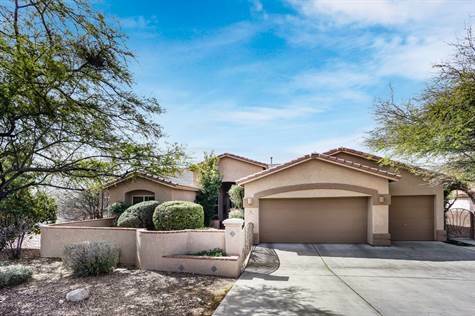 Bright, gourmet kitchen w/granite counters, Kitchen Island & spacious breakfast bar. SS appliances, breakfast dining area. Master suite opens onto patio. Master bath has separate shower and tub including full length sliding glass mirrors. Laundry room has sink, folding counter and w/d hook up. Entertaining in your backyard paradise with covered patio, bbq, plus uncovered flagstone patio with fireplace, pool/spa with waterfall feature and separate Ramada. Mature landscape provides privacy. 3 car garage, TUSD school district. Convenient to shopping, DMAFB and Raytheon.